It has been over a month since my last post but a lot seems to have happened since then. One of the biggest life milestone was finishing up at the job I had been in since I graduated from university. Though I knew it was time to let go, it did not make the parting any less emotional. There were many tears before and after the official announcement and on my last day, the waterworks hit even before I got up to say my final farewells. It is still slightly surreal, probably because I have not started my new job yet but I’m sure once I’m back in an office space again it will hit me afresh. What I realised was that at the core of it, it was the people, it was the relationships that I was finding hard to let go of. I know it is not like I’m not going to be friends with my now ex-colleagues but it is more that the relationship dynamics have shifted, we won’t see each other every weekday anymore nor share in some of the in-jokes that used to fly across the partitions. It is that ending that I still mourn quietly in the heart. And now it is time for a new chapter, a new beginning. The old is gone, the new has come (almost). Trying to squeeze in the last few tasks on my to-do list before I settle back into the rhythms of full-time employment. Does anyone still following this blog??? Not surprised if this blog is but a distant memory in the blogosphere… despite my best attempts, 2014 wasn’t much of a blogging year. I did try to restart it with monthly updates on the other space, but even that trailed off towards the end of the year. The latest update can be found here. Without going into a huge overshare about what’s been happening the last year, I’d like to share about a recent double date with one of our favourite couples, GR. 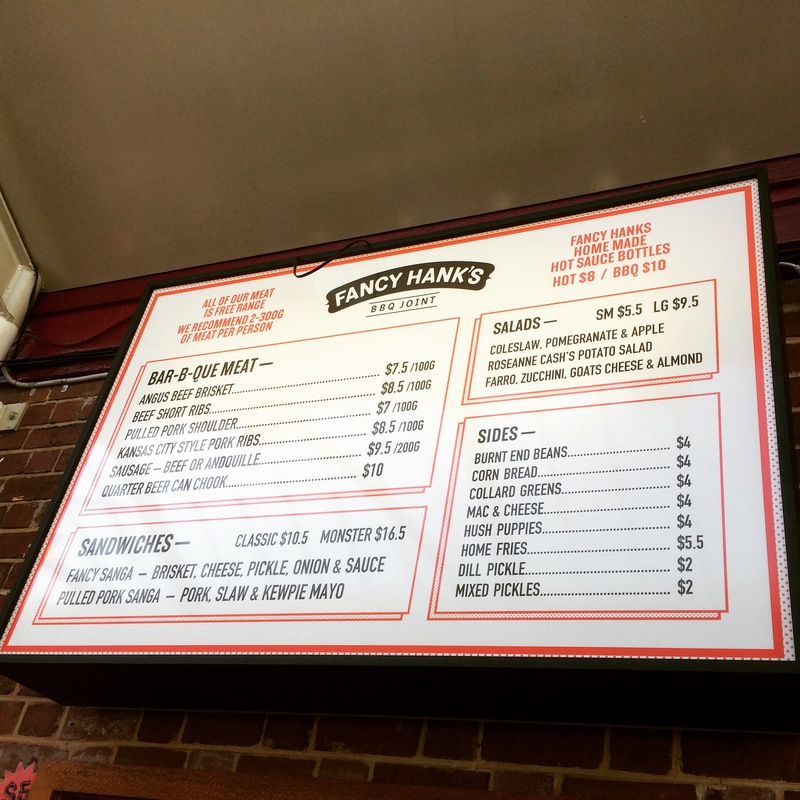 On our first double date we were keen to try out Fancy Hanks up near QVM, however, when we got there, they were closed for food orders so we vowed to return to try the American style food offerings. So one sunny Sunday afternoon, we finally made it! Now a tip for newcomers, order before you sit down for a chat. The wait time for ordering was about 30 minutes even though we had arrived at 6:00pm. I guess with only one person at the register, things can only go so fast! 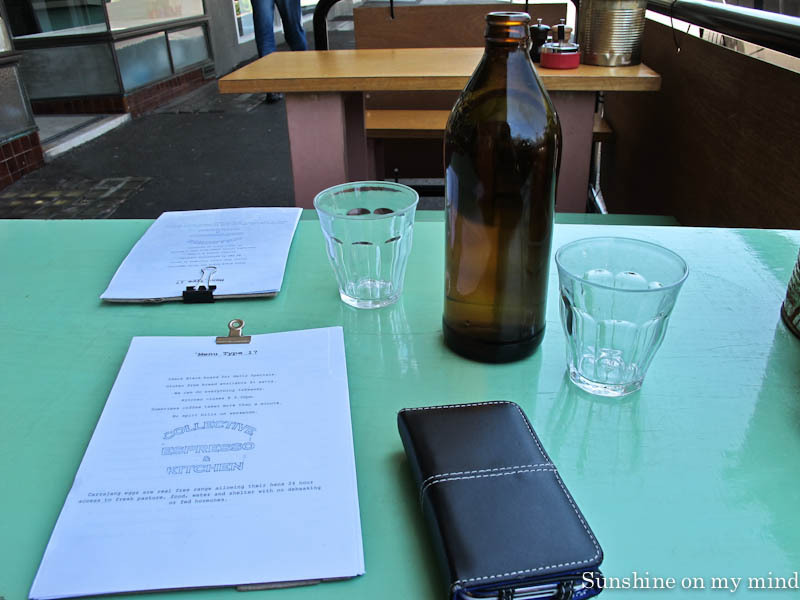 By the time we got to the counter they had already sold out of the beef short ribs and the quarter beer can chook *sadface*… so we collectively ordered the rest of the meat on the menu and a serve of each of the salads PLUS a side of burnt end beans and a hush puppie (not the shoes!) *happydance*! My favourite was definitely the pulled pork – very tender. I was also surprised by how much I enjoyed the beef sausage! 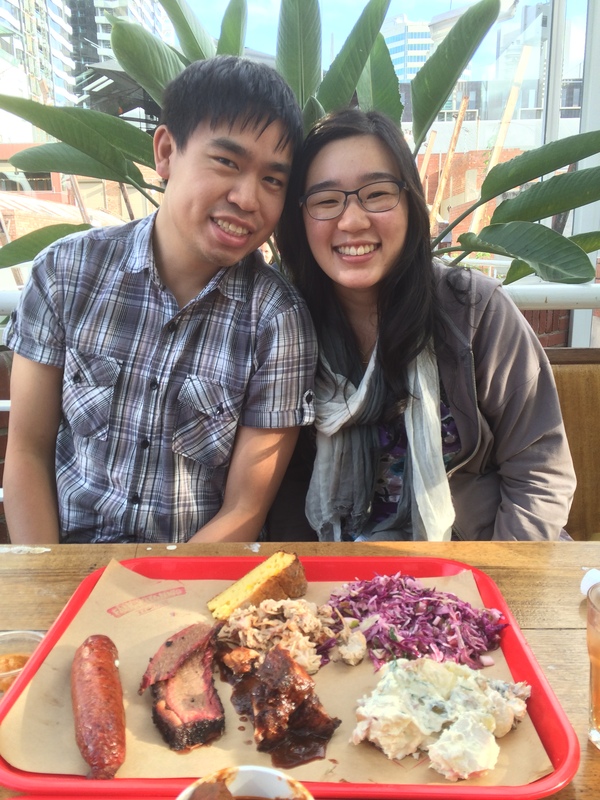 The others thought the brisket was the real winner – looked like Chinese char siew to me hehe! Ribs were very tasty as well. I’m usually not a fan of coleslaw but this one was very refreshing with the addition of pomegranate. 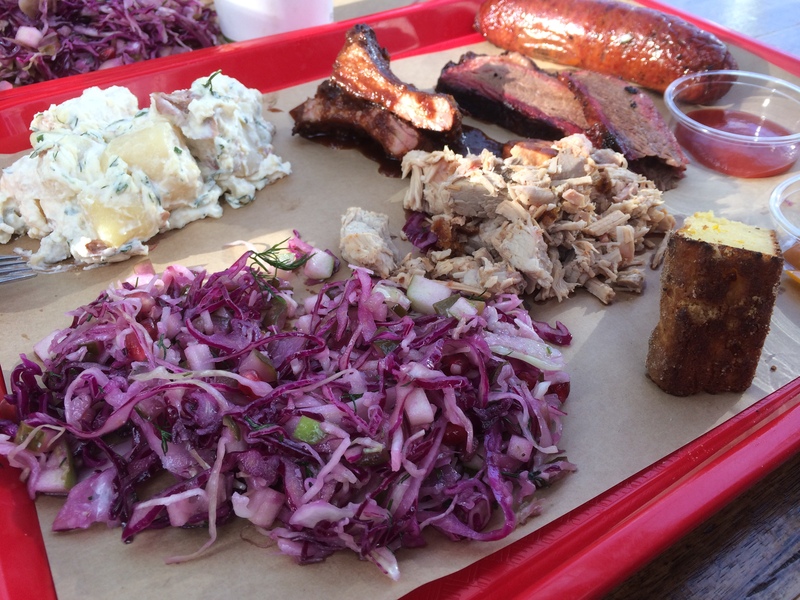 The burnt end beans side was also a highlight – it’s not just beans ;). 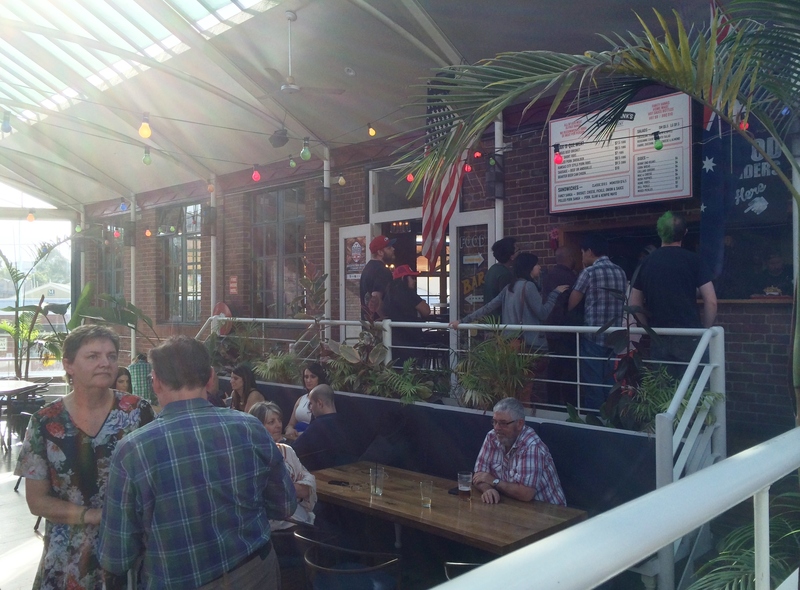 The atmosphere of the place is great as well with some live music at the start of the night – though a bit loud if you are going there to chat. 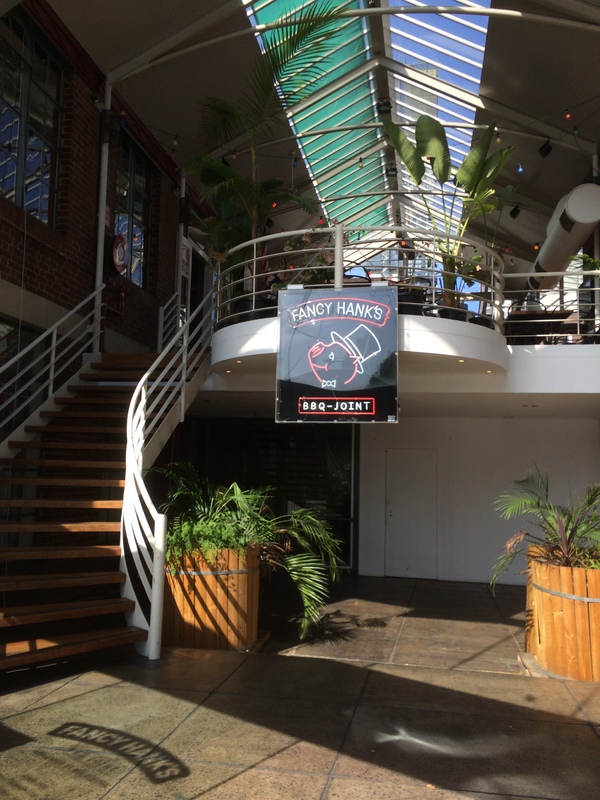 They also have a separate bar section as well with plenty of drinks available to go down with all that meat! 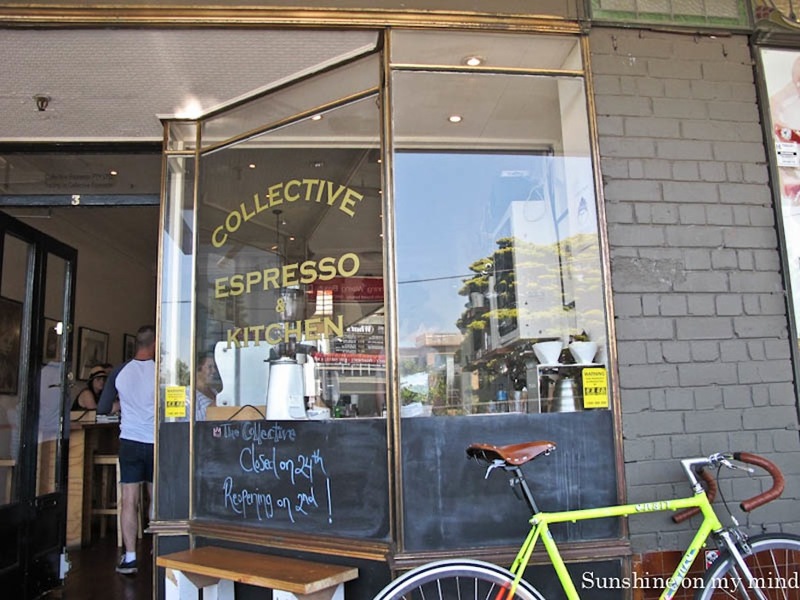 Get in early and order first before finding a seat. 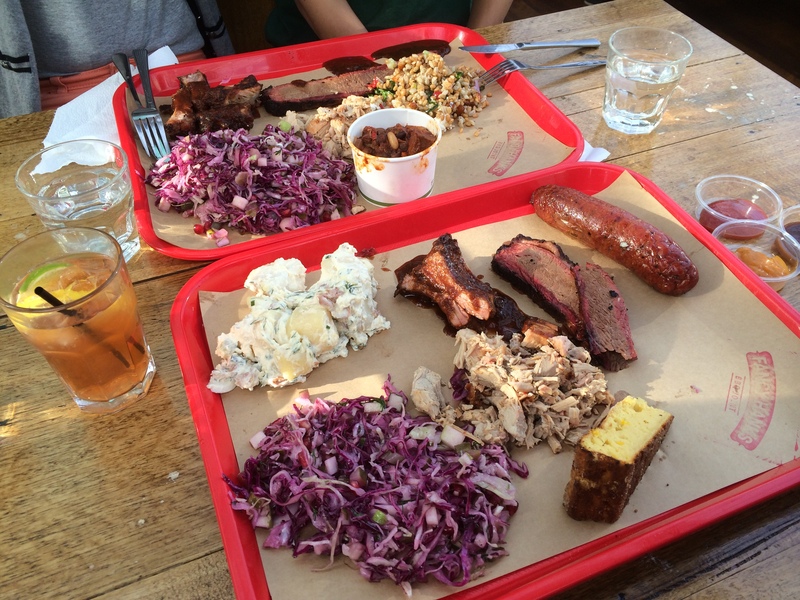 Do order: brisket, pulled pork, salads and burnt end beans. Don’t sit too close to the music if you want to talk (that’s a no-brainer really lol). 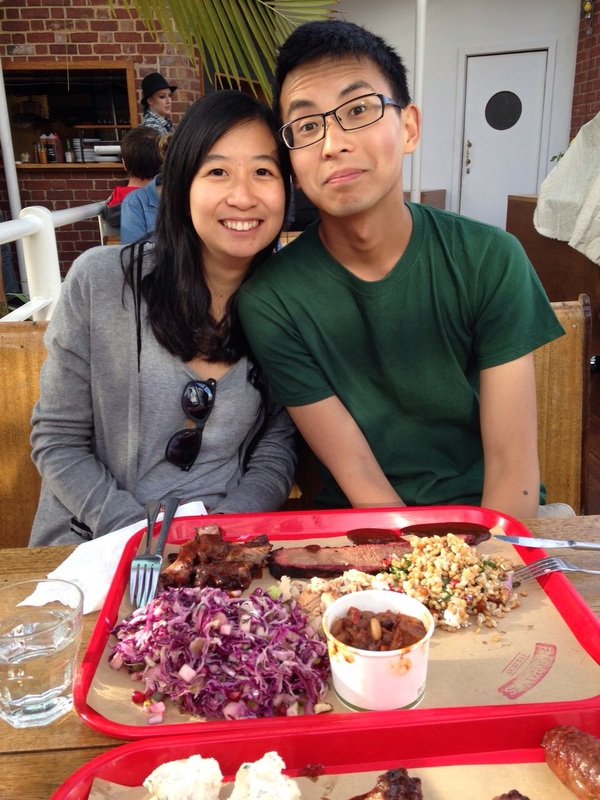 Go in a group so you can try more of the different meats :D.
Thanks GR for a great catch up :). #doubledate no. 3?? Oh and E for the recommend hehe. 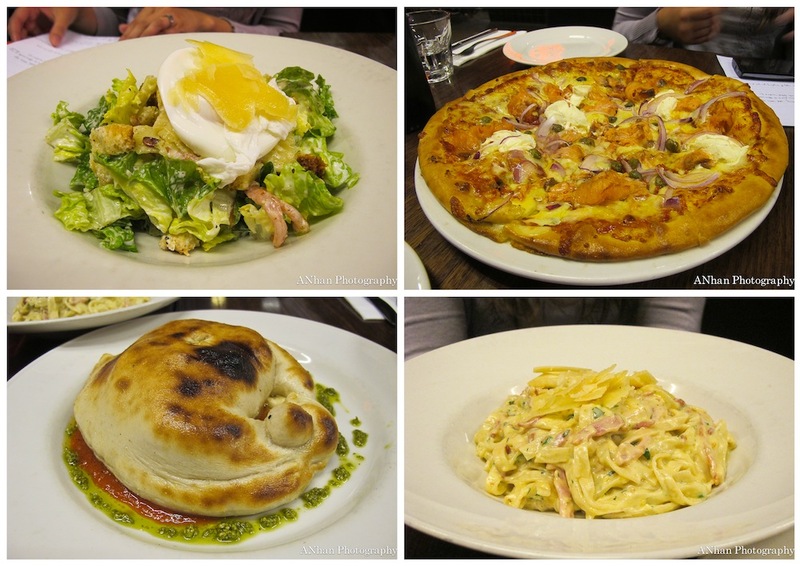 OK how did I do for the first foodie post after over nearly a year?? :P Not so fussed at the moment with formatting and photo sizing at the moment, just want to get back into it really. Feel free to leave your comments below – happy for feedback. 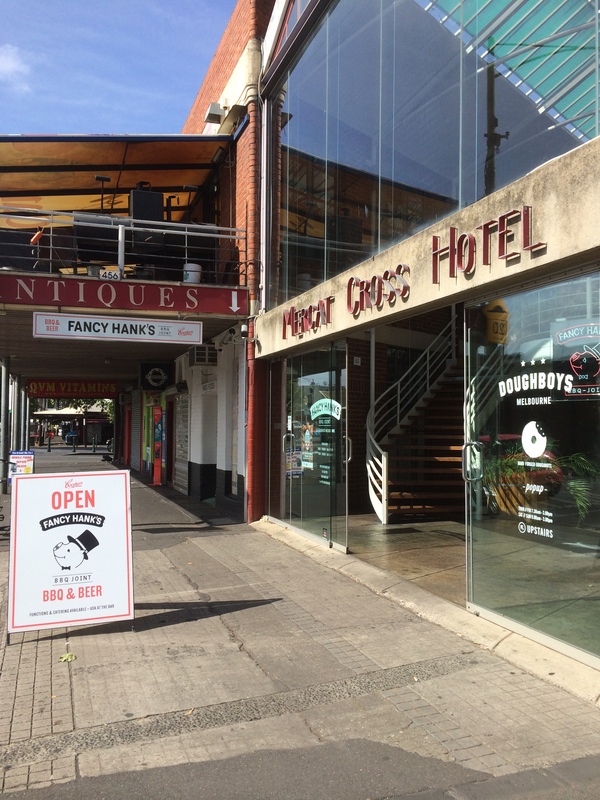 Move aside Momo Sushi, Pearls and cheap Chinese – there’s a new eatery in law school town! 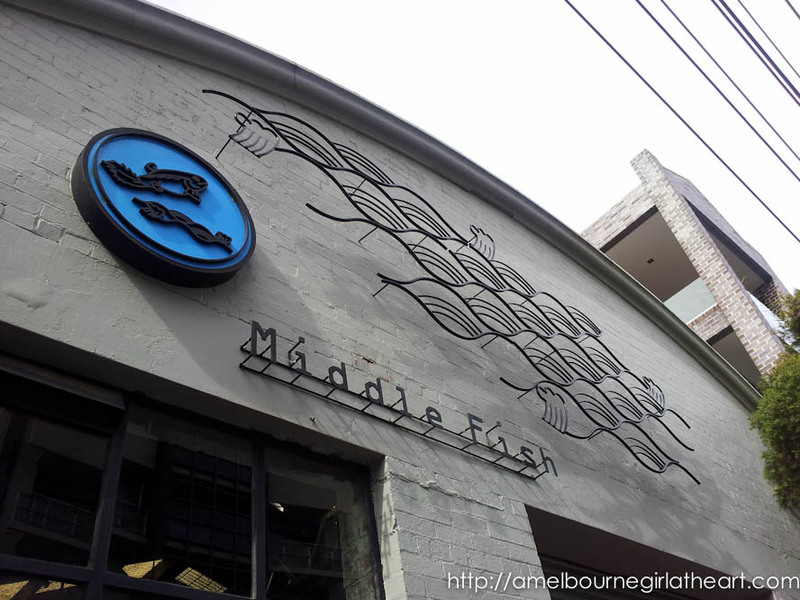 When you wander down to Middle Fish during lunch hour, the first thing you will notice is just how packed the place is! Located conveniently next to Seven Seeds (entrance on Berkeley St side), this Southern Thai café has won the hearts and stomaches of many law students and lecturers since it opened about 6 months ago. 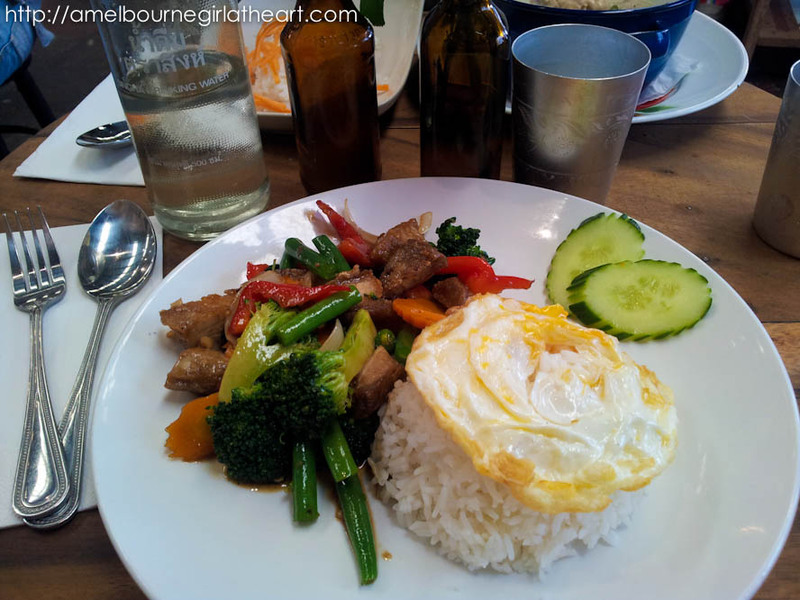 On my first visit, I tried the Pad Gapao Moo Kob ($15.50), which was a delicious serving of pork belly, assorted stir-fried vegies and fried egg with rice. 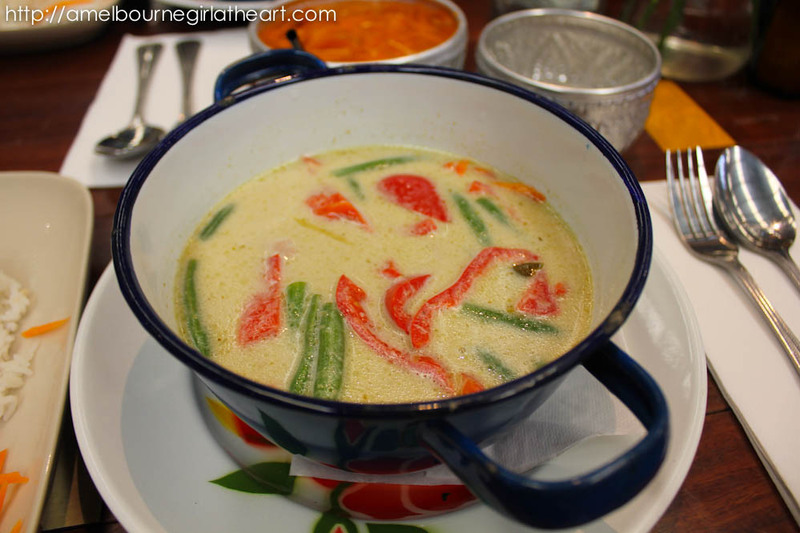 My fellow law student had the Green Chicken Curry ($14.50), which I tried on my second visit. The Green Chicken Curry came with rice (as most main dishes) and with SO MUCH chicken and sauce that I just had to order some roti ($3.50) to finish it off (that’s how good it was!) – can’t seem to find my photo of the roti :(. 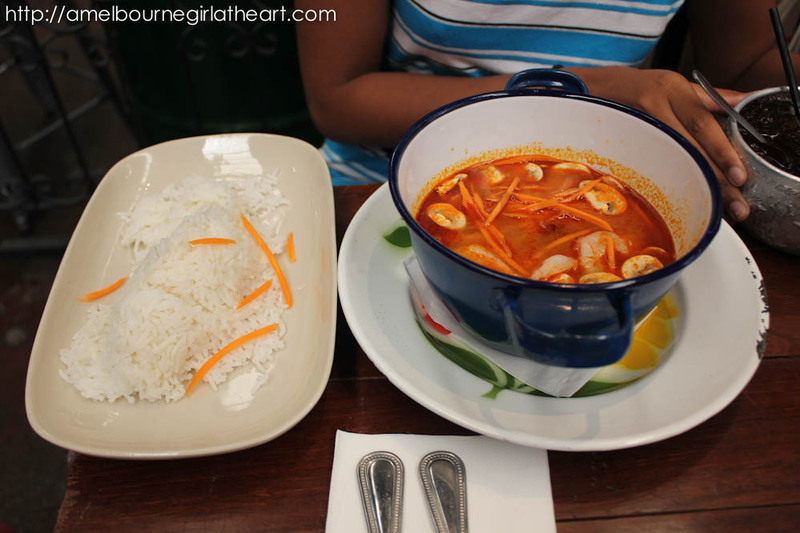 Another one to try is their Tom Yum ($14.50) that had an abundance of juicy prawns and a perfect balance of sweet and sour (so says another law student). Addition: On a separate occasion after I sent this off to the publishers, I had the Gapi Fried Rice (forgot to note the price) as mentioned in this post. Normally I don’t order fried rice when I’m out (Asian pride thing I think) but I made an exception because the use of apple in this dish intrigued me. The apples made this dish quite refreshing and the separating all the ingredients on the plate meant that it not only looked good to the eye when it came out (and you could see exactly what was in the dish! ), but it meant that the apple strips remained crisp and crunchy even after you mixed it together. Very filling and satisfying. 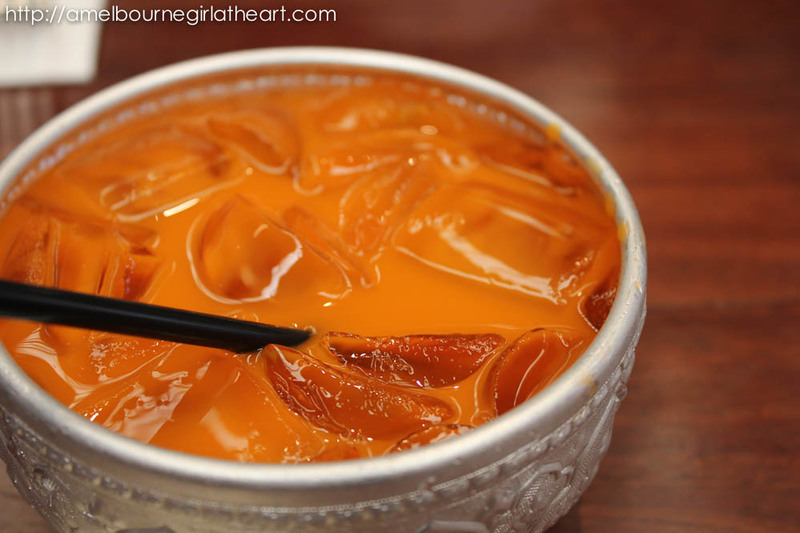 Now don’t forget to give their Thai Milk Ice Tea a go too! Served in what looks more like a bowl than a cup, it a sweet accompaniment to any meal! 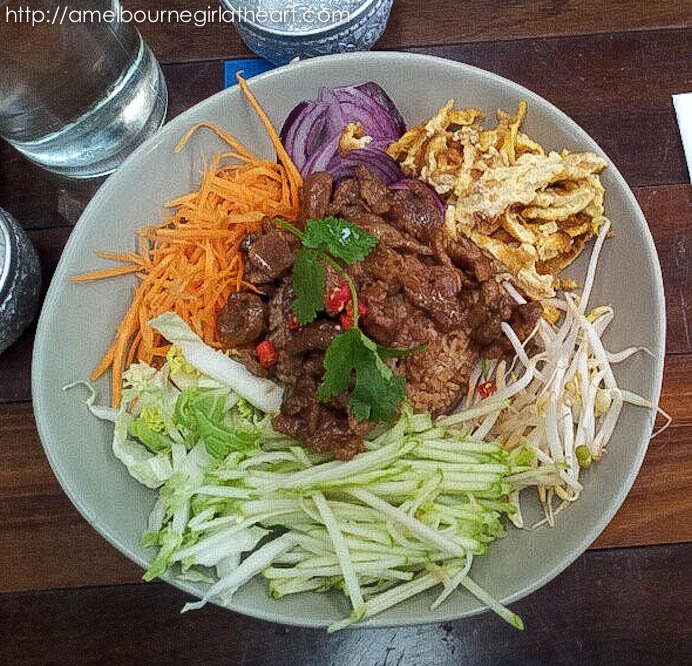 Loved how it was served in a little bowl too! 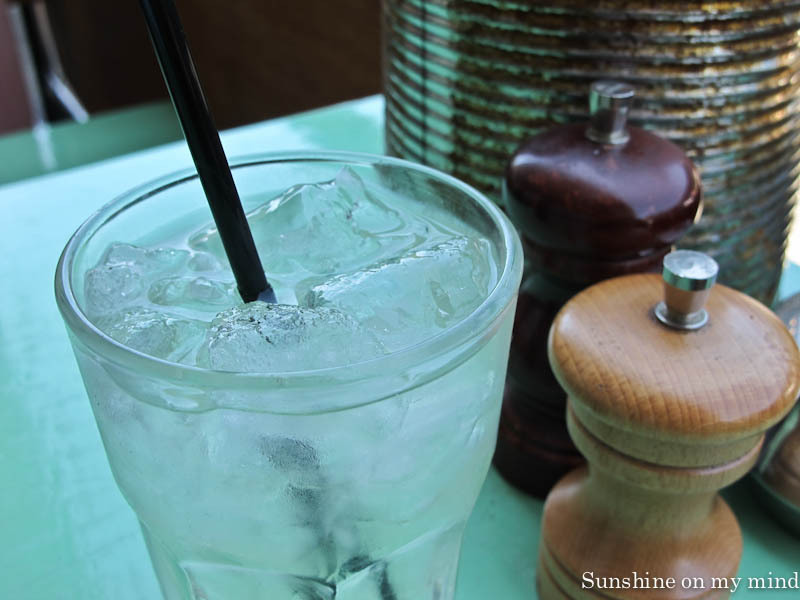 Price Range: ~$4.00 for drinks, $15-$25 per meal. A bit outside what I’d usually spend on a regular student lunch but it’s a pleasant change to the usual sandwich, sushi or salad every once in a while :). I admit it. I’ve got Facebook withdrawal symptoms. Been reading and commenting on a few blogs here and there to make up for the lack of social networking so decided I needed to make a contribution too lol. No random questions tonight… just hope you’ve all had a good start to the week :). It’s rare that I go to a restaurant twice in one week but somehow I ended up at the Groove Lounge for lunch on a Saturday and then was at the Groove Train for dinner the following Wednesday. The Groove Train has a number of franchises and as I’ve found out, they are all slightly different. I thought I would be eating most of this pizza with mushroom, eggplant, roasted capsicum, pumpkin, spinach, onion, mozzarella cheese & Napoli sauce topped with basil pesto but I think they were a bit too generous with the pesto and so I found it a bit oily. The base was just right for all the pizzas :). Pretty good though nothing that was particularly memorable. Really enjoyed this pizza as the tzatziki on top was a refreshing contrast to the marinated lamb strips. Spinach, fetta and the Napoli sauce were good accompaniments. Was good to have something else besides pizza lol. Went for a bit more variety this time with our core team however, now that we were paying for it, we realised how expensive the place is :S.
Smoked salmon, Napoli sauce, Spanish onion, cream cheese & capers = fail-proof combo :). Can’t go past a good Carbonara with pan-fried bacon & spring onions, tossed in a creamy egg yolk & parmesan cheese sauce though for the price you pay, it’s not that great money for value. For our meal at The Groove Train it worked out to be about $15.00 per person and so I put aside $7.50 for the Eat Out: Help Out Project. See the story behind the Eat Out: Help Out Project here. I wouldn’t mind going back to The Groove Lounge if it wasn’t so far off but I think in future (unless someone else is shouting!) I won’t be heading on The Groove Train any time soon :P.
And so, I’m now on the other side of my clerkship interviews, yay! I’m definitely glad for the opportunity to have chats with HR personnel and Partners at the few firms that gave me a chance :). They all had a slightly different feel but at the same time, I could see myself happily working in any of them… some interviews were more structured than others, some were longer, some more conversational… but one thing they all asked me about was ‘food blogging’! Haha, I threw that in as an afterthought on my CV and sure enough, the question rolled around (usually as the last one before heading out the door!). Though this isn’t strictly a food blog, I find that most posts usually revolve around food because most of the gathering of friends and family that I have come hand in hand with feasting together :). Oh right – the food! 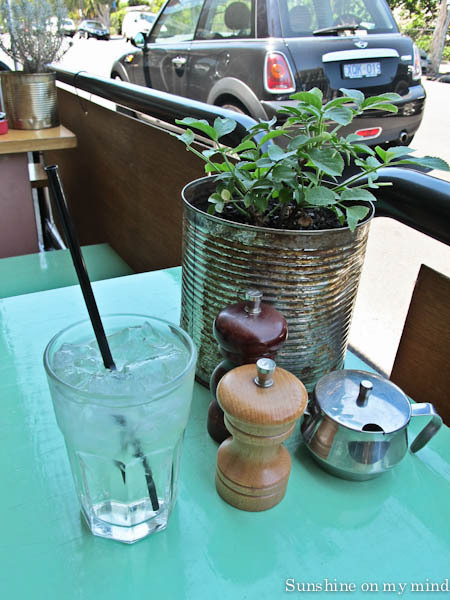 We decided on The Deck on Mercantile Place (it can be a bit hard to find – from cnr of King Street and Flinder Street, walk up King St then turn left into the first lane and go up the stairs) since they have a $10 pizza + drink deal on Thursdays. It was quite busy when we first arrived around 6:30ish but we were able to snag a set of couches for ourselves after 30 mins so that was good. Sadly, they didn’t have the roof open so we missed out on star-gazing (*sad face*) but their global pizza menu was well received by the group (*happy face*). 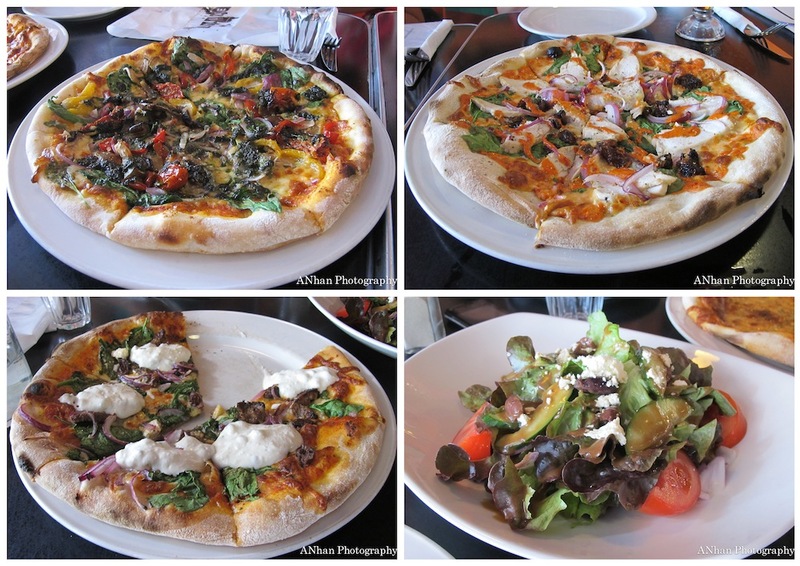 The lighting was quite horrible for photos so you’ll just have to trust me when I say that each pizza looked divine! They each came in a cardboard box and so we just used those as our serving plates, ha! The pizzas were the size of ‘small pizzas’, cut into four which was perfect for a bit of swapsy to try other flavours (eating 4 pieces of pizza with the same type of topping can get a bit monotonous)… I chose the North Italian Pizza and did a swap with Slug (Tasmanian Pizza) and Rach (Moroccan Pizza). I thought the ones I tried all tasted great albeit a bit cold – but that was mainly because our attention were often diverted away from the pizza to the conversation bubbling away :P.
So if you are looking for some cheap pizza in the CBD on a Thursday night, try out The Deck! Probably would be even better in summer! 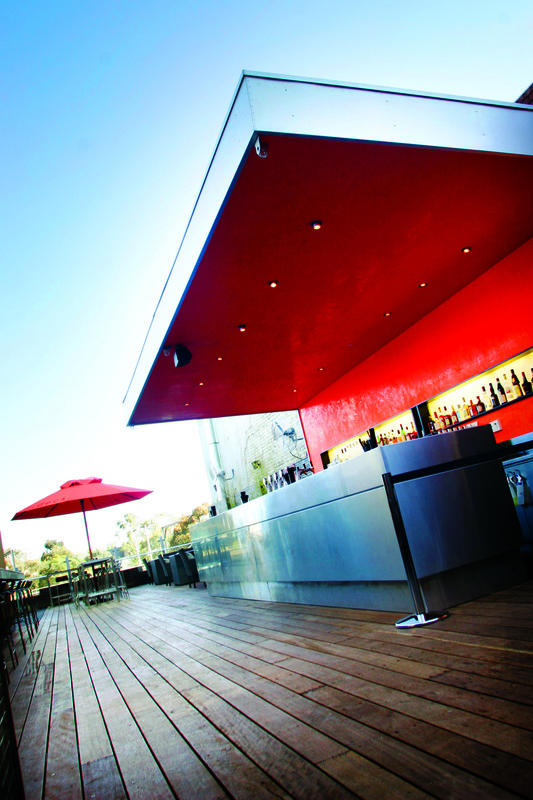 The Deck only trades on Thursdays, Fridays (12pm – late) and Saturdays (6pm – late) and is connected to the Waterside Hotel. P.S. Those who get notifications of this new posts will possibly question why I’m up at 4am haha, just finished off my notes for Remedies so thought I should reward myself by blogging ;). 2 more days of break in which to get as far along with my research essay as possible, yikes! See you later…zzzzz.